This month you’ll have Venus retrograding back into your relationship sector while Uranus retrogrades back into your sign. As a result you may feel yourself being torn between the desire to merge with another (Venus) and an overwhelming desire for freedom (Uranus). Like the Charioteer in this card — from Timothy Lantz’s gorgeous Archeon Tarot — you may be in for a bit of a bumpy ride, at least in the relationship department. This Charioteer is depicted as warrior goddess, harnessing two vastly opposing energies. The blue and red stallions embody hot and cold (or fire and ice) energies and are rearing up in two different directions. You may be met with obstacles, but you’re clearly up for the challenge: there is a sense of confidence and strength seen here in the way she takes charge of the two rearing beasts. And there’s a sense of fatedness as well: as in the symbol of the goddess Maat above the moon and the overlay of constellations in the background. The Moon in the background glows a brilliant gold. It almost looks like a Sun: more “opposing/diverging” symbolism. And yet we see the warrior goddess standing front and dead center, as she strives to restore order to the chaos around her. You’ll likewise be called upon to both maintain control and harness the opposing forces in your own life. Your challenge will be to find a way to pull your energy inward and funnel it outward into one solid direction. You can accomplish a lot through sheer force and determination — as long as you’re aware of the need to focus your energy in one primary direction. You’ll have find a way to balance the diverging energies in your life. But if you can “pull it together” you’ll make great strides toward accomplishing your goals. With Mars and Jupiter moving through your 8th house this month, you may be thinking about closing the door on one chapter in your life and opening another. The Transformation card is the Vision Quest Tarot’s version of the traditional tarot’s Death card. It speaks of putting certain things to rest — whether that be a relationship that you’ve been holding onto for far too long, a belief system that no longer serves you, or material possessions that you’ve accumulated but no longer have any use for. The Death card is scary for some. Because it represents having something we’ve grown accustomed to taken away. But this card focuses on the transformative effects of “Death” in that all that you release will not only be replenished, but will get you one step closer to your own evolutionary potential. It reminds us that energy never dies and that nothing we’ve lost is ever really gone. 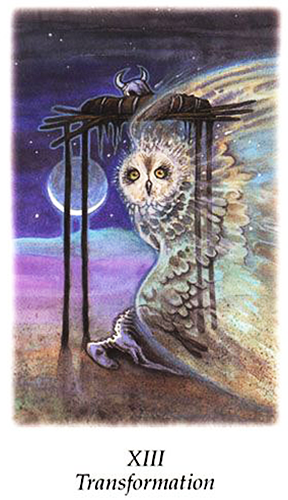 It’s simply transformed and renewed, like the spirit of the owl overseeing the remnants of a tribal monument on this card. The animal’s carcass may be old and weathered, but the Moon in the sky is new, reminding us that endings always lead to new beginnings. Sometimes the Universe shows us just what we don’t need by removing it from us forcefully from our grip. In this sense the “death” can be a painful undertaking. But if you choose instead to cooperate, it can be an incredibly liberating experience. You may have to accept that the very thing you so desperately cling to is the one that’s holding you back. In this respect, it’s more about leaving behind something that probably wasn’t working for you anyway and moving toward something that you’re naturally more aligned with in the end. Mars (your ruler) has now moved into your sign. And what better card to depict that energy than the Prince of Wands — the Druid Craft Tarot’s version of the Knight of Wands? This card speaks of gathering up the courage and confidence that’s needed to go after your goals. It may be a dream you’d set aside because you lacked the time, energy or resources to follow it n the past. It could be an interest that’s been calling out to you that’s no longer possible to resist. And it might be something (or someone) you’re passionate about that you’re only now in a position to pursue. The Prince of Wands encourages you to move past your fears and go after your dreams with the attitude that nothing can stand in your way. You don’t want to waiver or second-guess yourself; you want to grab onto opportunities that present themselves without a moment’s hesitation. This doesn’t mean you ought to go gallivanting across the countryside without a plan. Keep in mind the Prince of Wands can be a bit rash — in an act first and figure out how to get out of whatever predicament you’ve gotten yourself into later sort of way. Because he runs on adrenaline, he has a tendency to lose interest in anything routine. If this is someone in your life, you will know him by his confidence and bravado. He may he here to teach you the importance of embracing some of these qualities yourself. 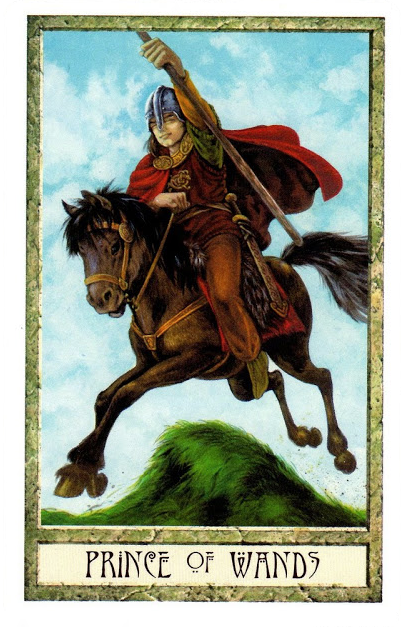 But if instead this card represents an energy and attitude you already possess, keep in mind the importance of making preparations and pacing yourself so you don’t run out of steam. The Prince of Wands is here to remind you that it’s a good time to dream big, challenge yourself and set your goals in motion. If you temper those goals with a enough discipline and perseverance, you may just see them manifest beyond your wildest dreams. This month you should be presented with opportunities to look back over the strides you’ve made and the challenges you’ve faced in recent months as you begin a brand new cycle. 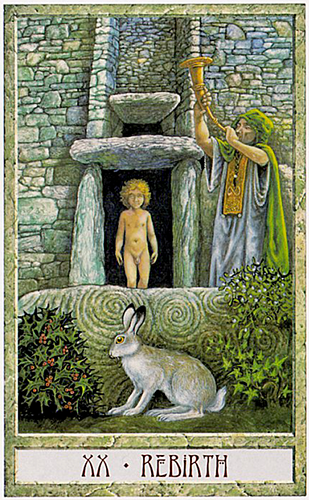 The young child in this card stands at the doorway between past and present. He still has an opportunity to look back behind him and clear up any unfinished business. But he has that same opportunity to venture forward and face a brand new world. This is the Druid Craft Tarot’s version of the Judgment card. It’s the endless human journey that we sometimes refer to as “karma.” We reap and sew with each thought, action, and decision. This card calls for self-evaluation and awareness, a need to develop enough spiritual altitude to look objectively at your mistakes and short-comings as well as your triumphs and victories. It is a powerful reminder that in order to put the past behind us we must not only let go of prior judgments but heal the wounds that have been holding us back. It’s a card of both atonement and forgiveness. Of unconditional love, understanding and acceptance — for both ourselves and for those who’ve hurt us or let us down. This card represents a summation of all that has come before, and an awareness that each step taken — from here on out — leaves an indelible imprint on our future. It represents a calling — a spiritual call to action, where the past meets the present and beckons you toward the future. March is the month for honoring the relationships you have developed with loved ones and family members. It’s a month for rejoicing and celebrating — whether this means planning for a party or special event, or getting yourself out of the doldrums and washing away the blues. 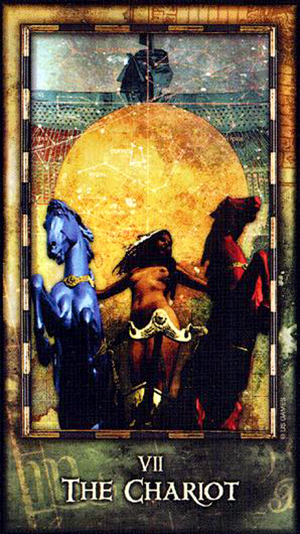 The Four of Wands — this version from the beautiful Tsigane Zigeuner / Gipsy Tarot by Walter Wegmüller — takes the “dream big” energy that came with the Three of Wands and turns it into something tangible, solid and lasting. It represents a joyous celebration, such as a marriage, a promotion, the birth of a child. It tells you that “this is only the beginning” of something you’ve already established and that it’s bound to just keep getting better. This month is about expressing love and affection for those who are there for you even when the going gets tough. 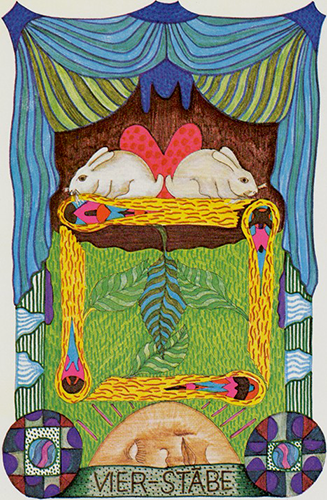 It’s about basking in the power of love — like the two bunnies in this card. No matter what else you’re up against remember to be grateful for what you have. It’s not the time to isolate or withdraw from social opportunities. Look around you and take note of all you’ve accomplished thus far. Chances are good there’s a lot to be grateful for and a cause for celebration right there in front of you. Today is a day for taking care of yourself as well as others and if there has been any imbalance between the two lately then it’s time to take a look at that. The Queen of Cups — this version from Charissa Drengsen’s Steampunk Tarot — is sensitive, loving, nurturing and maternal. She may take on a motherly role among friends and co-workers. People look up to her and rely on her for guidance. If this is you, you may need to remember how much people value you in this role. If you’re so caught up in business or social affairs that you don’t have time for one-on-one with those who matter most, it’s time to take a second look at what’s most important to you. 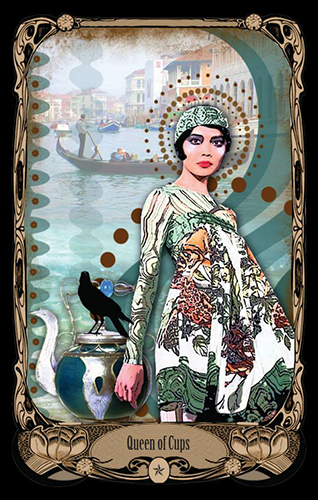 The Queen of Cups though may be someone in your life — a parent, older sibling, friend or supervisor. If this is someone in your life, know that she’s got your best interests at heart. She may be the person you need to turn to when you’re feeling insecure or uncertain. She may also be a version of you that needs to be brought to the forefront. Either way — it’s all about giving and receiving comfort. Making others feel at home. Letting them know you are there for them. And being willing to take off your business attire and assume that role yourself. October is going to be a good month for you to focus on attracting abundance and prosperity into your life. The Ace of Pentacles — this version from the Animism Tarot — refers to new opportunities for growth, prosperity and abundance, of which material (financial) gain is only a small part of. 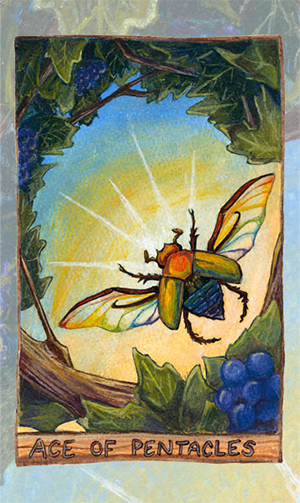 It refers to planting seeds which then grow and flourish, and ultimately begin to propagate and replenish themselves — much like the grape vines framing the scarab on this card. You want to be thinking about what you have this month rather than what you lack. What you’ve invited into your life rather than what you’ve left behind. And what you’re putting out there now, as a means of attracting more of the same. The Ace of Pentacles is a card of assurance and inspiration. It’s a “Yes” card, a manifesting card, a card of limitless promise and potential. It’s an essence rather than a “thing,” which means you have a lot of say in how it plays out. If it’s money you want (or security, stability, comfort, etc.) now is the time to work on attracting more of it into your life. It represents the start of something new, in this case new financial opportunities. It encourages you to plant seeds that you can tend to, nurture and grow. The scarab is a sacred symbol of mystery, magic, creation and transformation. How fitting is it then that this one — suspended mid-air between shade and Sun — is participating in an energetic exchange? It pulls energy from the Sun and sends it right back out. The Ace of Pentacles encourages you to participate in your own energetic exchange. Whether it’s time, money, energy or aid, all of us have resources at our disposal. Put yours to good use this month and see what the Universe sends back. July is a good month to join heads with like-minded people in the spirit of community and cooperation. The Three of Pentacles — this version from the Cheimonette Tarot — is all about team-work, group efforts and collaboration. It’s a reminder that two (3 or 4) heads are better than one and that none of us can achieve alone what we can achieve with others. Although many aspects of this card emphasize friendship and celebration, this one focuses more on integrating the disparate parts of self. Body, Mind and Spirit come to mind. The Three Pentacles in this version contain a Sun Face, an Eye and a panoramic scene with yogi and horse figures. The disks are all interconnected with the Sun disk shining a little brighter over the other two. A crescent moon with another eye rests below the three disks. In addition to teamwork and collaboration, the Three of Pentacles also speaks of hitting your stride and seeing the initial results of something you’ve been working hard on. It speaks of breathing new life into a project or finding the “key” to something that has been puzzling you and holding you back. The Three of Pentacles — like all threes — refers to the initial stages of progress where you’ve taken an idea (the Ace), put it into production (the Two) and are making progress now toward creating something real (the Three). Today you may feel the need to step away from the demands on your time and energy, and treat yourself to something special. 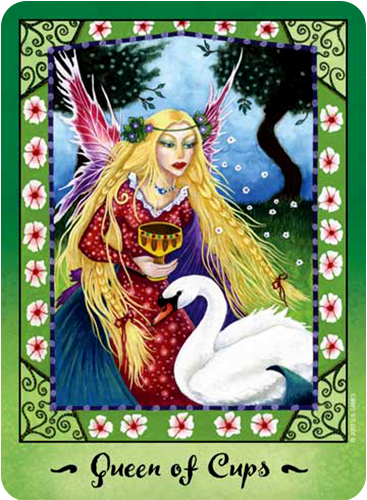 The Queen of Cups is known to be sensitive, compassionate and caring. She’s also incredibly loving and giving — in fact she’s so giving that she may sometimes forfeit her own needs as she focuses her attention on others. 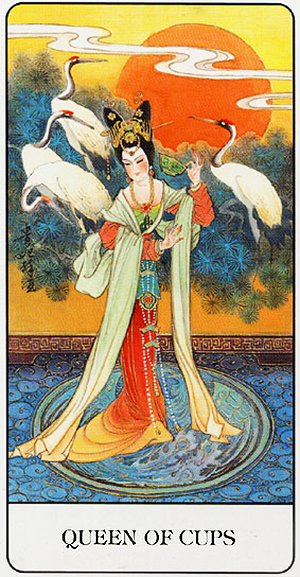 But this Queen of Cups — from the gorgeous Chinese Tarot by Jui Guoliang — seems to know a thing or two about tending to her own needs. She’s not only surrounded herself with luxury, she’s indulging all five of her senses. There’s the aromatic incense wafting through the room, the colorful Ibises painted on the wall, the tinkling bells that adorn her elegant headdress, the delicate tea she sips from her dainty cup, and the opulent silken fibers that make up her royal garb. This Queen has created a sacred space for her to retreat to and indulge her appreciation for the finer things in life. She’s graceful and elegant and probably also quite wealthy. You can tell that she’s very much at home in the space she’s created and is certainly in no hurry to leave it behind. As Venus and Jupiter inch closer together today (completing their conjunction on the first), you may be thinking of ways to pamper yourself in more elaborate and extravagant ways — especially since this conjunction is in Leo. Remember that you’re going to have to learn to take care of yourself first before you’re going to be able to take care of others. Take some time today to create your own sacred space and nurture your own spirit. Like the Queen of Cups in this card, you want to find a way to create a calm, soothing environment for yourself, especially if you’ve neglected your own needs while caring for others. Make today a day of treating yourself, pampering yourself and restoring your own inner peace. Today would be a good day to step away from all of the noise and distractions going on around you in the outside world and retreat into your inner sanctuary. With Venus sextiling Jupiter and Mercury trining Pluto today, you should be able to tap into your own sacred space and regroup — even if just for a short while. 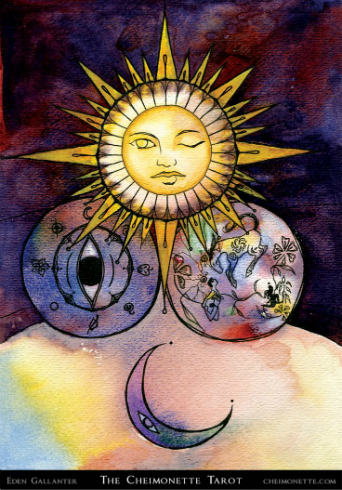 The Queen of Chalices — the Yoga Tarot’s version of the Queen of Cups — is so good at caring for and nurturing others that she may forget to take the time to pamper herself. But this Queen is here to show you how it’s done. 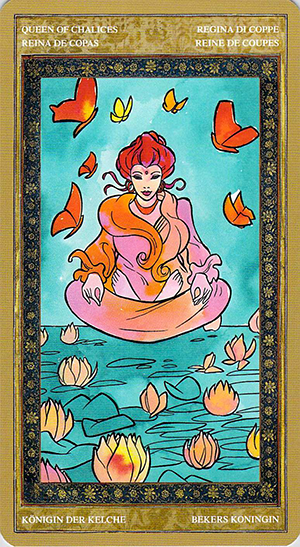 She’s seen levitating over a pool of lotus blossoms in a classic meditation pose. She’s positioned herself in the most peaceful and relaxing environment possible, with soothing colors and a relaxing array of ambient lighting. She gazes down into the tranquil waters while butterflies flit gently around her head. Her hands rest gently on her lap in the classic mudra for peace. The Venus / Jupiter sextile brings the “greater benefics” together in harmony. It serves as a conduit between peace and joy, love and gratitude, grace and beauty. 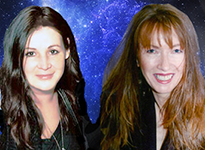 The Mercury / Pluto trine allows you to tap into the restorative powers of your own psyche. It provides intimate access into the primal energy that flows through you, activating and energizing your chakras. It allows you to awaken the kundalini powers within that rise and nourish your spirit. Take some time today to create your own sacred space and nurture your own spirit. Like the Queen of Chalices in this card, find a way to create a calm, soothing environment for yourself and “rise above” the noise that can interfere with your ability to alleviate stress. You may have neglected yourself while caring for others. But today is a day of treating yourself, pampering yourself and restoring your own inner peace. This month may see you feeling torn between two competing interests or desires and at a loss as to which one one you really want to follow. You start the month with an opposition between Mars (your ruler) and Jupiter, which are moving through your 11th (social) and 5th (personal) houses. The Mars transit has you thinking about where you fit in in the world and about the contributions you’ve made. The Jupiter transit is more personal: it’s more about creativity and self-expression. As difficult as it is to balance these dual desires, you may find yourself at an impasse. It’s hard to feed one set of urges without feeling like you’re neglecting the other. You may need to take the time to reflect, much like the Heron in this card. Here we see him gazing down at his reflection in a tranquil pool. A crescent moon shines in the night sky, illuminating the pair of feathers that are crisscrossed on the water’s surface. The Heron is this deck’s version of the Two of Swords. 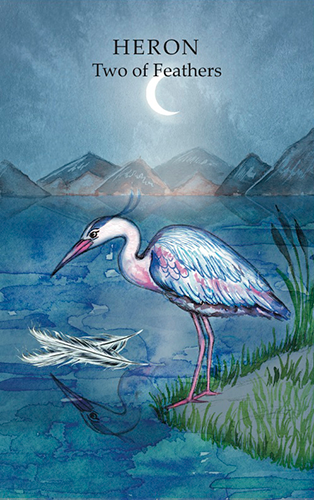 As this card often refers to inaction and immobility, you might take a page from the Heron’s book and use that inertia to reflect on your options before you make a move. Aries is usually more about “act first and think later.” But this month you might want to hold back and weigh your options instead. In doing so you may just be able to find a way to satisfy both sets of urges. Today is a day about taking care of yourself as well as others and if there has been any unbalance between the two lately then it’s time to take a look at that. There is a touch of the fairy about this image and predominance of the colour green shows that there is healing around for you. You may wish to choose where and whom you deliver this healing to as if you need more energy for yourself there is no use giving it out to others when you could be replenishing your own reserves. Any pet project you have going on or in the pipeline will need careful surveying today and the finishing touches may need to be put in place. There is help at hand for this as the white petals float down from the tree in the background giving new thoughts that come from nowhere to help you. You may feel as if you have a lot of energy to share around today as can be seen from the red dress worn yet you do not need to put as much of that energy into everything you do as the delicate fairy wings show just a smidgen of energy goes a long way. Therefore go from one project to the next and don’t get bogged down in any one thing. Do not take on the problems of others as if they were your own. Keep a healthy distance and take notice of boundaries. This may be the lesson you are learning today… where you begin and others end.